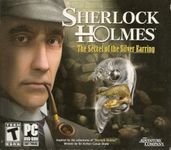 The game uses an original plotline - set in London in 1897 - and allows the player to investigate a murder as Sherlock Holmes and Dr. John H. Watson. Holmes and Watson must investigate the murder of Sir Melvyn Bromsby at Sherringford Hall. Bromsby's daughter Lavinia is among the suspects.